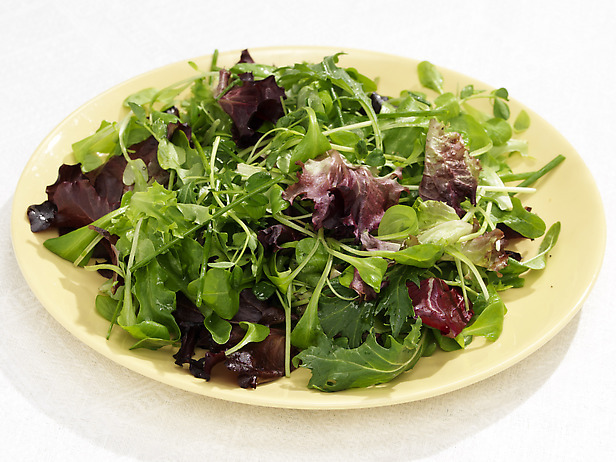 Can Salad and I Coexist? The last few days I have been going out to eat. I have ended up at places that serve mostly burgers, sandwiches and fried food. They also had several salads to choose from. I am finding that I am defaulting to a burger with no bun and fries. After last night, I thought to myself, with all of the changes I have made eating gluten free in the last month. And, all of chances I am taking with trying new foods. Is it possible for salad and I to coexist……or even be in a committed relationship? Instead of taking leftover chicken wings to work for lunch, is it possible for me to make a fresh, healthy salad the night before? In the past, I would have answered, Absolutely Not! But, in the last few months I have tried and liked so many new vegetables, that I really think it is possible. Why am I trying to cut gluten out of my diet, if I am just going to replace it with hamburgers and chicken wings? Seems a bit ridiculous when I actually think about. So, here is my declaration to the world. Beginning now, I am going to give salads a chance. I know that the options are unlimited, so there is no way I am going to fail! If you are out to eat with me, do me a favor when I say I am going to order a burger sans bun. Give me tap and ask me if that is really my best option! Thanx in advance!! I am on Day 10 of my new Gluten Free way of eating. I have spent most of the last ten days eating at restaurants or making tacos with corn tortillas. I have been fairly successful so far, and have been learning a lot as I go. Last night was a chilly rainy night after a week of 80 degree weather, so I figured a dinner of comfort food would be perfect. 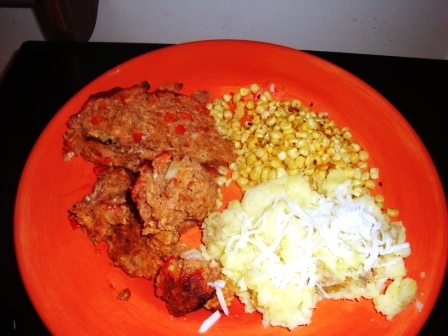 So, meat loaf, mashed potatoes and corn it was. The picky eater in me has never had an issue with potatoes and corn, and they are both naturally gluten free. So, there was no concern there. But, I can be pretty picky about meatloaf, and I was going to have to figure out how to make it without the traditional bread crumbs. 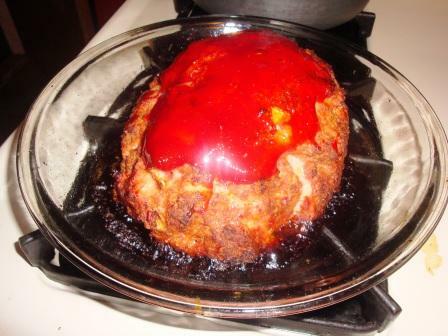 The only meat loaf I will ever eat is my mother’s. She has learned over the years to grate the onions she uses so the pieces aren’t big enough for me to see. And, doesn’t add any other vegetables that many other people or restaurants will add. I figured I could take this opportunity to not only make a gluten free meat loaf, but also add some typical meatloaf ingredients that I normally wouldn’t eat. When searching Gluten Free Meat loaf, I found that most of them used either quinoa or gluten free bread crumbs, and either ground beef or turkey. I decided right away that I would use gluten free bread crumbs since I am still new to gluten free cooking and this may be the closest to what I am used to. I also switched up the recipe a bit from just ground beef or turkey, to half ground beef and half ground pork. I threw in some chorizo for flavor. I also used chopped onions and red peppers. Both of which would have made me pass on meatloaf in the past. I also don’t like when meat loaf is made in a loaf pan. It doesn’t allow for a nice crust all of the way around. Another reason I won’t order meat loaf in a restaurant. 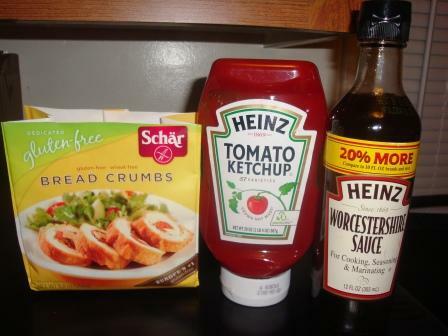 While standing in the grocery store in front of the ketchup and Worcestershire sauce, I was glad to find that many Heinz products are gluten free. They have an entire list of gluten free products on their website. For most people St. Patrick’s Day means enjoying a plate of corned beef and cabbage. Being a picky eater I never considered trying either. For some reason I assumed that corned beef wasn’t cooked, and I just plain wasn’t going to eat cabbage. The thought of eating it made me gag. This St. Patrick’s Day I have the fact that I am on an adventure to try new foods as well as it falls on Day Four of my attempt to eat gluten free. I really had no reason not to try it, and every reason to give it a go. I stopped in at Derry Hegarty’s pub to have a few drinks with friends before heading downtown to see Gaelic Storm. 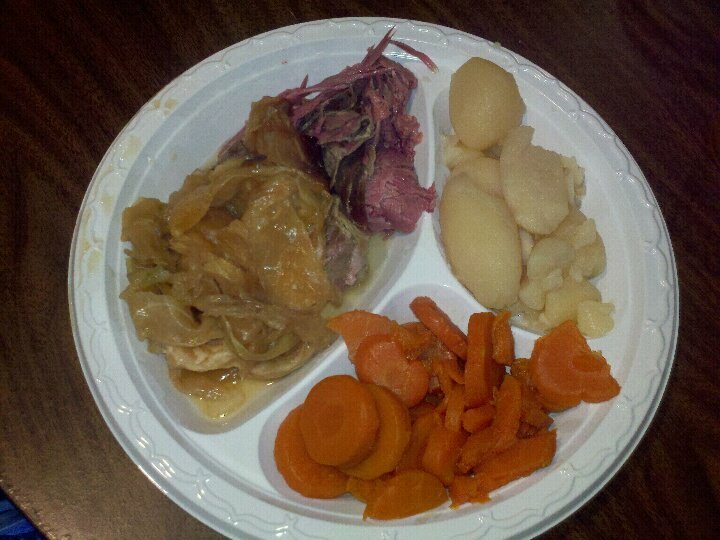 I got the corned beef and cabbage dinner, which came with potatoes and carrots. I figured I could at least eat the potatoes and carrots if nothing else. I was told that the corned beef was a bit overdone, and the cabbage wasn’t as fresh as it could be, but surprisingly I liked both of them. The corned beef had a nice flavor to it, and the cabbage wasn’t nearly as gross as I imagined it would be. I will definitely adding both to my list of foods to try again. I would love some suggestions on where I can get quality corned beef and cabbage. So…I am that person anywhere I go that orders my red meat Well Done! I usually follow that up with “I mean Really Well Done…Cooked…All of the Way….No Red….Anywhere!” Every burger I eat, every steak I order, I check before every bite to make sure I am not eating anything that has a hint of pink on it. If I get a filet, I order it butterflied, just to make sure it is thin enough to get cooked all of the way through. With burgers, the thinner they are the better. The middle is a bit tricky to get cooked all of the way through. I have been told by more people than I can count that I am ruining the steak, or I am not getting the real experience of a good burger. You definitely don’t want me in charge of the grill at a BBQ…and plenty of people have let me! 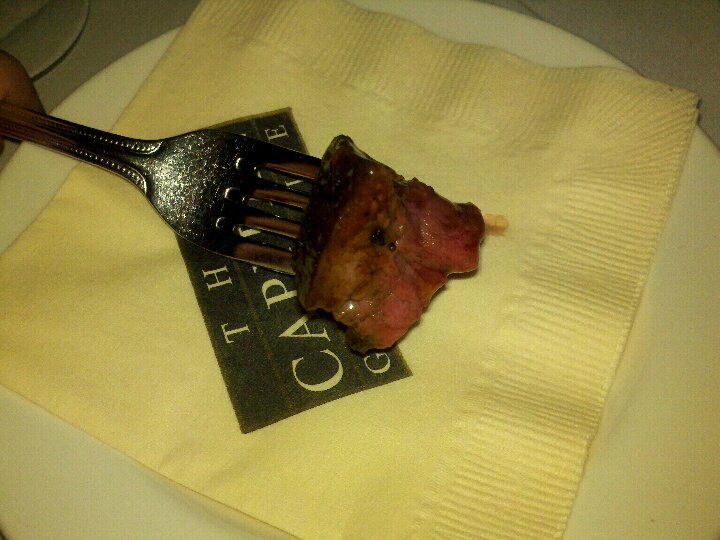 I was recently lucky enough to attend the Yelp – Milwaukee 2012 Welcome Reception at The Capital Grille. The event included complimentary drinks and several complimentary items from their lunch menu. We were offered a tenderloin sandwich. The first bite wasn’t bad….but, bite #2 was painfully obvious to me that the tenderloin was just beyond cooked medium. I couldn’t eat anymore. I quietly laid the sandwich on a back table and walked away. We then got a tour of the kitchen by the Executive Chef and shown their dry aging process of some of the best cuts of meat you can get in the area. I didn’t ask, but something told me they wouldn’t be willing to cook a steak well-done. The Chef then offered us two different pieces of tenderloin. Both with house made rubs, with a 12 year balsamic drizzle and butter/shallot reduction. Both were also cooked just barely beyond medium (in my opinion). Very…Very…Red!! I figured this was my time to give it a really go. What better place. In a high end restaurant, with quality meat, and by a Chef who take pride in the food that he cooks! A little confession, I did pick out the piece that was less red than the majority of the pieces on the table. I was extremely surprised to find that the bite size piece of meat pretty much melted in my mouth. It didn’t require the constant chewing, steak sauce and glass of water I sometimes need at other places. I ate a few more pieces, both of which had a touch more red in them. I can’t say I will be going to The Outback anytime soon and ordering a big thick steak rare or trying to cook a burger anything other than nice and brown any time soon. But, I may consider opting for medium well if I find myself eating at another good quality restaurant. Here’s to eating meat the way it should be!